If you’re an avid golfer, your iPhone can be a great boon to your game. Improve it by downloading one of the greatest golf apps on the App Store - Swing Profile. This is a very useful swing analyzer tool for golf training, swing analysis and coaching. That’s why we’re pronouncing it a Sports App of the Month! For gold players and golf coaches from all around the world, here comes an extremely useful iOS app called Swing Profile. See and refine your technique over every swing with this award-winning and easy-to-use automatic golf swing analyzer and training aid, train yourself to improve your game by using what this app has to offer – and that is neat user interface and great features. Let’s discuss them! Swing Profile is a golf analyzer tool that’s created for golf training, swing analysis and coaching. Already used and trusted by coaches and players from all around the world, this app is able to automatically capture and play back your golf swing completely handsfree. You will have the opportunity to see instant replay of your own golf swing after the shot, which will definitely help you in refining your skills and techniques. 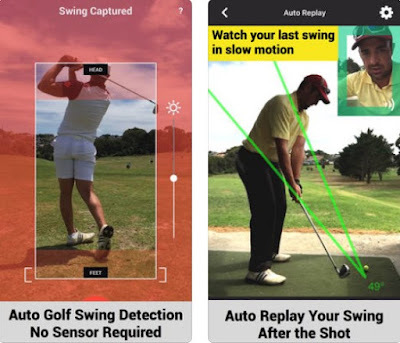 The app includes various cool features, such as Auto-Replay Golf Training, Auto Swing Detection, Auto Create Swing Sequence, Auto Draw Swing Plane, Auto Trim Video, Auto Synchronize, and many more. Moreover, it offers tools for golf schools and golf teams: Voice-over, High Speed Recording, Group Chat, Cloud Storage, etc. No more spending money on new hardware or attaching clumsy sensors to your golf club, all you need is your iPhone or iPad and the Swing Profile app. Point at a golf swing with your device’s camera, and Swing Profile’s advanced Artificial Intelligence will automatically detect the swing, and create golf digest style swing sequence for checking those critical golf positions. Automatically detecting and recording your golf swing, Swing Profile can be downloaded from the App Store – free of charge, with some subscription options.